This multi-tasking moisturiser contains SPF 50 to protect skin from premature signs of ageing and sun damage, while shea butter leaves skin soft and hydrated. The anti-ageing formula contains tone-improving ingredients like niacinamide and liquorice for more even-toned and younger-looking skin. Customer Care: Thank you for sharing your experience with us - we're sorry to hear this didn't work as expected for you, but we are glad that you are able to use the Resist Moisturiser SPF50 for combination skin. I actually got this item free because Paula's Choice was doing a campaign in Oct 2018. I love how silky this SPF is, it goes on and soaks into my skin so quickly and easily. It leaves no streak marks and doesn't make my skin white, it just soaks in nicely. It also has a nice smell and I am also glad it is a moisturiser too. I would buy this again also considering it is SPF 50. Love the broad spectrum and high SPF protection, and very moisturising for the skin (though not enough just in the winter so usually use another moisturiser under to top up). Lasts ages even with fairly liberal use. Super moisturiser. Complete with SPF 50. This moisturiser is amazing!! Leaves my normal/ dry skin moisturised and hydrated and doesn't irritate my sensitive skin either! I love the fact it has SPF as I am fair and burn easily. Doesn't have a horrible smell and sinks into the skin nicely. I would definitely recommend this product! I was quite excited when it came out and imagined it to be like the Resist Cellular Defense just with a higher SPF. It's nothing like it. It's more of a thin lotion that leaves a dryish texture on my skin and is also drying it out. Sorry, but this is an expensive dud for me and it's most definitely not suitable for dry skin, never mind very dry skin. very happy with other PC products but super disappointed with this. Customer Care: Hello ms Bennet, thank you for sharing your experience with us - we're sorry to hear you didn't like this moisturizer as much as our other products! Please contact a member of our Customer Care team, who can assist you with a possible alternative. 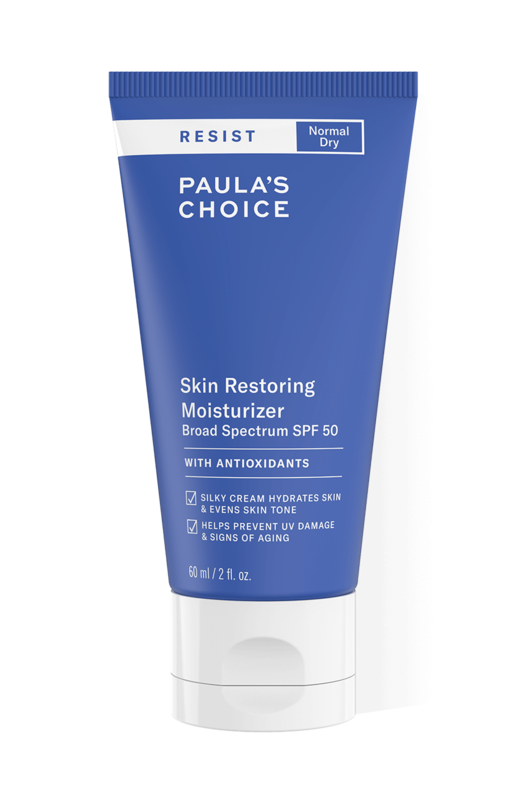 I've been struggling with SPF products this year, even Paula's Resist Youth Extending SPF, which was my go-to. Everything made me oily or dry or broke me out etc etc. I'm putting it down to menopausal changes in body chemistry. Anyway, decided to try this new Resist product and I love it. My skin feels happy - comfortable, hydrated, smooth to touch - and looks nice too. No break outs or other reactions so far. Thank you so much Paula! This product is amazing - it is super hydrating and absorbs really well at the same time. I found it really easy to apply my foundation afterwards. Works perfectly for my normal to dry skin!! What is the difference between the Resist Anti-Aging Skin Restoring Moisturizer with SPF 50 and the discontinued Resist Anti-Aging Cellular Defense Moisturizer SPF 25? SPF: The day moisturisers differ in their SPF. The new Resist Anti-Aging Skin Restoring SPF 50 contains a higher SPF and is a synthetic sunscreen, the Resist Anti-Aging SPF 25 was a mineral sunscreen. Texture: The Resist Anti-Aging Skin Restoring SPF 50 has a more lightweight, fluid texture that is easy to apply but rich enough for dry skin. Formula: The Resist Anti-Aging Skin Restoring SPF 50 not only helps to prevent new signs of ageing, but also contains added ingredients (like niacinamide) to help to reduce existing signs of ageing. Brown spots will become less visible and skin tone more even. 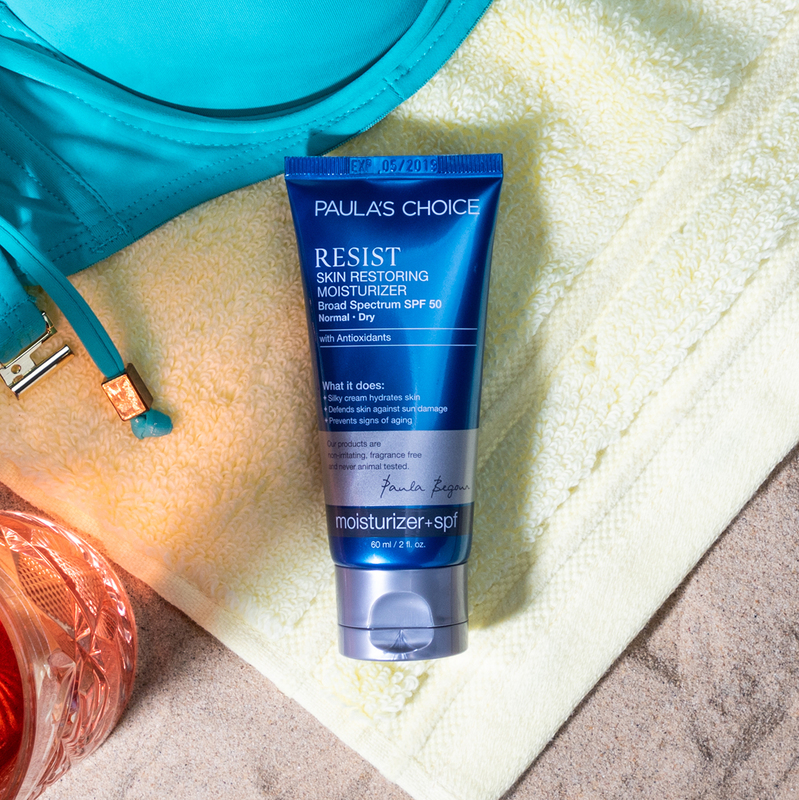 The Resist Anti-Aging SPF 25 only prevented new signs of ageing. Can I apply the moisturiser around the eyes? The Resist Anti-Aging Skin Restoring Moisturizer SPF 50 can be used around the eye and orbital bone. In general we don’t recommend applying the moisturiser directly onto your eye lid. Is the Resist Anti-Aging Skin Restoring Moisturizer with SPF 50 suitable for Rosacea prone skin? It’s not clear what causes rosacea-prone skin to react and while you most likely won’t experience any problems using the Resist Anti-Aging Skin Restoring Moisturizer SPF 50 we recommend using a day moisturiser with a mineral sunscreen. Try our Skin Recovery Daily Moisturizing Lotion SPF 30 or the Calm Moisturiser SPF 30 for normal to dry skin. How often should I reapply this product? To get the right amount of protection apply the product liberally. When skin is exposed to direct sunlight you’ll need to reapply every two hours. If you plan to swim or if you sweat you must reapply. Journal of the American Academy of Dermatology, March 2017, pages S100–S109; Indian Dermatology Online Journal, July-August 2015, pages 311-315; Oxidative Medicine and Cellular Longevity, September 2015, ePublication; Pharmaceutical Biology, July 2015, pages 5-18; Pharmacognosy Review, January-June 2014, pages 52-60; Antioxidants, September 2013, pages 181-193; The Journal of Clinical and Aesthetic Dermatology, January 2013, pages 16-26; DermatoEndocrinology, July 2012, pages 308-319; Journal of Complementary and Integrative Medicine, January 2012, ePublication; and Journal of Agricultural Food and Chemistry, 2006, issue 7, pages 2,558-2,562.